Lumbinī (Nepali and Sanskrit: लुम्बिनी listen (help·info), "the lovely") is a Buddhist pilgrimage site in the Rupandehi District of Province No. 5 in Nepal. It is the place where, according to Buddhist tradition, Queen Mahamayadevi gave birth to Siddhartha Gautama in 563 BCE. Gautama, who achieved Enlightenment some time around 528 BCE, became the Buddha and founded Buddhism. Lumbini is one of many magnets for pilgrimage that sprang up in places pivotal to the life of the Buddha. For the zone of Nepal, see Lumbini Zone. For the Municipality of Nepal, see Lumbini Cultural Municipality. Not to be confused with Lumbini Gardens or Lumphini Park. Lumbini has a number of older temples, including the Mayadevi Temple, and various new temples, funded by Buddhist organisations from various countries, have been completed or are still under construction. Many monuments, monasteries and a museum, and the Lumbini International Research Institute are also within the holy site. Also, there is the Puskarini, or Holy Pond, where the Buddha's mother took the ritual dip prior to his birth and where he had his first bath. At other sites near Lumbini, earlier Buddhas were, according to tradition, born, then achieved ultimate Enlightenment and finally relinquished their earthly forms. Lumbini was made a World Heritage Site by UNESCO in 1997. In the Buddha's time, Lumbini was situated in east of Kapilavastu and southwest Devadaha of Shakya, an oligarchic republic. According to Buddhist tradition, it was there, that the Buddha was born. A pillar discovered at Rummindei in 1896 is believed to mark the spot of Ashoka's visit to Lumbini. The site was not known as Lumbini before the pillar was discovered. According to an inscription on the pillar, it was placed there by the people then in charge of the park to commemorate Ashoka visit and gifts. The park was previously known as Rummindei, 2 mi (2 mi (3.2 km)) north of Bhagavanpura. The Sutta Nipáta (vs. 683) states that the Buddha was born in a village of the Sákyans in the Lumbineyya Janapada. The Buddha stayed in Lumbinívana during his visit to Devadaha and there preached the Devadaha Sutta. When King Devanampriya Priyadarsin had been anointed twenty years, he came himself and worshipped (this spot) because the Buddha Shakyamuni was born here. (He) both caused to be made a stone bearing a horse (?) and caused a stone pillar to be set up, (in order to show) that the Blessed One was born here. (He) made the village of Lummini free of taxes, and paying (only) an eighth share (of the produce). —  The Rummindei Edict, one of the Minor Pillar Edicts of Ashoka. The Ashoka inscription on the pillar today. The words Bu-dha (𑀩𑀼𑀥, the Buddha) and Sa-kya-mu-nī ( 𑀲𑀓𑁆𑀬𑀫𑀼𑀦𑀻, "Sage of the Shakyas") in Brahmi script. Luṃmini Gāme (𑀮𑀼𑁉𑀫𑀺𑀦𑀺𑀕𑀸𑀫𑁂, "City of Lumbini") inscription in the Rummindei Edict of Ashoka. —  Inscription of King Ripumalla on the Lumbini pillar of Ashoka, (13-14th century). 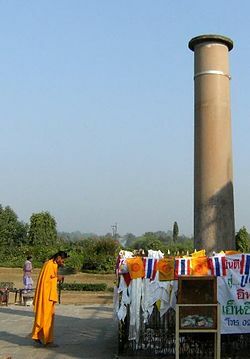 A second pillar of Ashoka is located about 22 kilometers to the northwest of Lumbini, the Nigali Sagar pillar (with inscription), and a third one 24 kilometers to the west, the Gotihawa pillar (without inscription). According to Robin Coningham, excavations beneath existing brick structures at the Mayadevi Temple at Lumbini provide evidence for an older timber structure beneath the walls of a brick Buddhist shrine built during the Ashokan era (3rd-century BCE). The layout of the Ashokan shrine closely follows that of the earlier timber structure, which suggests a continuity of worship at the site. The pre-Mauryan timber structure appears to be an ancient tree shrine. Radiocarbon dating of charcoal from the wooden postholes and optically stimulated luminescence dating of elements in the soil suggests human activity began at Lumbini around 1000 BCE. The site, states Coningham, may be a Buddhist monument from 6th-century BCE. Other scholars state that the excavations revealed nothing that is Buddhist, and they only confirm that the site predates the Buddha. Lumbini is 4.8 km (3 mi) in length and 1.6 km (1.0 mi) in width. The holy site of Lumbini is bordered by a large monastic zone in which only monasteries can be built, no shops, hotels or restaurants. It is separated into an eastern and western monastic zone, the eastern having the Theravadin monasteries, the western having Mahayana and Vajrayana monasteries. There is a long water filled canal separating the western and eastern zones, with a series of brick arch bridges joining the two sides along the length. The canal is serviced by simple outboard motor boats at the north end which provides tours. The holy site of Lumbini has ruins of ancient monasteries, a sacred Bodhi tree, an ancient bathing pond, the Ashokan pillar and the Mayadevi Temple, where the supposed place of birth of Buddha is located. From early morning to early evening, pilgrims from various countries perform chanting and meditation at the site. A non-governmental organization named Samriddhi Foundation started in 2013 working extensively in the field of education and health specially in government schools of the area where underprivileged children study. A non-governmental organisation called "Asia Pacific Exchange and Cooperation Foundation" (APECF) backed by chairman of the Unified Communist Party of Nepal (Maoist) and then Prime Minister Prachanda, the Chinese government and a UN group called "United Nations Industrial Development Organization" (UNIDO) signed a deal to develop Lumbini into a "special development zone" with funds worth $3 billion. The venture was a China-UN joint project. A broader 'Lumbini Development National Director Committee' under the leadership of Pushpa Kamal Dahal was formed on 17 October 2011. The six-member committee included Communist Party of Nepal (Unified Marxist-Leninist) leader Mangal Siddhi Manandhar, Nepali Congress leader Minendra Rijal, Forest Minister Mohammad Wakil Musalman, among other leaders. The committee was given the authority to "draft a master plan to develop Lumbini as a peaceful and tourism area and table the proposal" and the responsibility to gather international support for the same. Nipponzan Myohoji decided to build a Peace Pagoda in the park in 2001, which is visited by many different cultures and religions every day. Because some Hindus regard the Buddha as an incarnation of Vishnu, thousands of Hindus have begun to come here on pilgrimage during the full moon of the Nepali month of Baisakh (April–May) to worship Queen Mayadevi as Rupa Devi, the mother goddess of Lumbini. Nepal's central bank has introduced a 100-rupee Nepali note featuring Lumbini, the birthplace of Buddha. The Nepal Rastra Bank said the new note would be accessible only during the Dashain, Nepal's major festival in October 2013. It displays the portrait of Mayadevi, Gautam Buddha's mother in silver metallic on the front. The note also has a black dot which would help the blind recognise the note. The name of the central bank in Latin script would be printed on the note along with the date of printing in both the Christian Era and the Bikram Era. The new note is being issued following a cabinet decision 27 August. Lumbini is a 10-hour drive from Kathmandu and a 30-minute drive from Bhairahawa. The closest airport is Gautam Buddha Airport at Bhairahawa, with flights to and from Kathmandu. The India border town of Sonauli in Maharajganj district is 1 hour drive from Lumbini and Nautanwa railway stations in India is just few kilometres away and nearest big city is Gorakhpur which is about 100km and is 4 hours drive from Lumbini. The nearest airport to Lumbini, that is, the Gautam Buddha Airport in Bhairahawa, is currently undergoing upgradation work. This small domestic airport is soon expected to become an international airport, with latest deadline set for 2019. The upgradation work of the airport has also caught the eye of investors and hoteliers, and a series of new hotels are being constructed now in and around Lumbini, hoping to catch in on the expected international tourist boom once the airport upgradation work is complete. The ancient Mayadevi Temple, Lumbini, Nepal. ^ Several alternative translations have been published. ^ a b c "Lumbini, the Birthplace of the Lord Buddha". UNESCO. Retrieved 1 March 2011. ^ Cousins, LS (1996). "The Dating of the Historical Buddha: A Review Article". Journal of the Royal Asiatic Society. 6 (1): 57–63. doi:10.1017/s1356186300014760. JSTOR 25183119. Archived from the original on 24 December 2010. ^ Schumann, Hans Wolfgang (2003). The Historical Buddha: The Times, Life, and Teachings of the Founder of Buddhism. Motilal Banarsidass Press. pp. 10–13. ISBN 8120818172. ^ "Lumbini, the Birthplace of the Lord Buddha – UNESCO World Heritage Centre". Whc.unesco.org. Retrieved 19 August 2013. ^ ""Gautama Buddha (B.C. 623-543)" by T.W. Rhys-Davids, The World's Great Events, B.C. 4004-A.D. 70 (1908) by Esther Singleton, pp. 124–35". Unz.org. 28 November 2012. Retrieved 19 August 2013. ^ "The Buddha (BC 623-BC 543) – Religion and spirituality Article – Buddha, Bc, 623". Booksie. 8 July 2012. Retrieved 19 August 2013. ^ "Ramagrama-Devadaha | Lumbini Development Trust". lumbini.planetwebnepal.com. Lumbini Development Trust. 2013. Retrieved 29 September 2016. ^ Violatti, Cristian (12 December 2013). "Kapilavastu". Kapilavastu - Ancient History Encyclopedia. Ancient History Encyclopedia. Retrieved 29 September 2016. ^ J.i.52, 54; Kvu.97, 559; AA.i.10; MA.ii.924; BuA.227; Cv.li.10, etc. ^ Sen, Dr. A. C. (2008). Buddhist shrines in India. Kolkota: Maha Bodhi Book Agency. p. 24. ISBN 978-81-87032-78-6. ^ Hultzsch, E. (1925). Inscriptions of Asoka. New Edition by E. Hultzsch (in Sanskrit). p. 164. ^ "Dr. Fuhrer went from Nigliva to Rummindei where another Priyadasin lat has been discovered... and an inscription about 3 feet below surface, had been opened by the Nepalese" in Calcutta, Maha Bodhi Society (1921). The Maha-Bodhi. p. 226. ^ Coningham, RAE; Acharya, KP; Strickland, KM; Davis, CE; Manuel, MJ; Simpson, IA; Gilliland, K; Tremblay, J; Kinnaird, TC; Sanderson, DCW (2013). "The earliest Buddhist shrine: excavating the birthplace of the Buddha, Lumbini (Nepal)" (PDF). Antiquity. 87 (338): 1104–23. doi:10.1017/s0003598x00049899. Archived from the original (PDF) on 5 December 2014. ^ Lars Fogelin (2 March 2015). An Archaeological History of Indian Buddhism. Oxford University Press. ISBN 978-0-19-994822-2. ^ "Programs/Projects >> UNIDO IP Projects >> Introduction". UNIDOitpo.org. Retrieved 15 July 2011. ^ a b "Lumbini Development Committee formed under Dahal's leadership". ekantipur. Retrieved 17 October 2011. ^ "Lumbini". Welcome Nepal. Retrieved 19 August 2013. ^ "Things to do in Lumbini". ^ "Airport construction triggers hotel boom in Rupandehi". Retrieved 11 July 2018. Wikimedia Commons has media related to Lumbini.